Over the years, there have been thousands of Magic: The Gathering cards, many with their own characters and mini-stories. Only one, however, is trans, and this one is pretty darn cool. Though most players don't dig into the collectible card game god emperor's mythos, they're expansive—untapped lands open for exploration. Sometimes it's generic fantasy, sometimes it's more interesting than that. One thing's for sure, though: there is definitely a fuckton of it. Wizards of the Coast recently added yet another entry to its years-spanning story tome with Alesha, Who Smiles at Death. 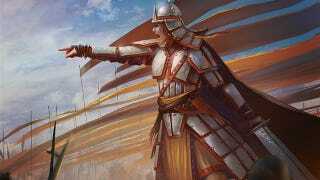 Her card is part of the recently released Fate Reforged set, and her story weaves together the culture of her battle-baptized clan (which she leads) and her own identity. It's pretty well done, despite the fact that it very much reads like Another Fantasy Story. "I saw you hold back. I saw you cut the beast's claw instead of its neck. Why?" The orc snarled. "I don't know." "You could have earned your war name," [Alesha] said. "Know who you are, and claim it." Anger twisted the orc's face and he took another step toward her. "You tell me this? A human boy who thinks he's a woman?" Alesha kept her face impassive as a nearby goblin squeaked and scampered away from her, no doubt anticipating her wrath. Before she could answer the nameless orc, though, the dragon was upon them.